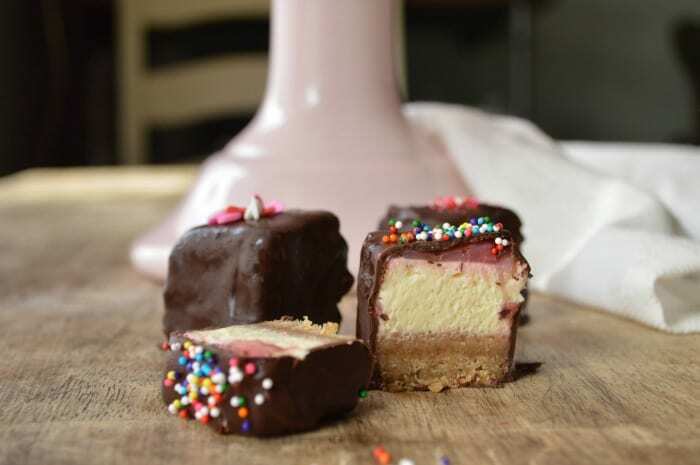 Chocolate Covered Strawberry Cheesecake Bites are a sweet way to express how much you love the cheesecake lover in your life. Smooth, creamy bites of cheesecake on a graham cracker crust, topped with strawberry sauce and coated in dark (or milk) chocolate! Valentine’s Day is only 3 weeks away! That’s crazy, right? Time to get out all the little paper envelopes and tear-apart Valentine cards. This year I feel like we need to GO BIG because I just realized that my youngest is in the 5th grade which means that this is the last year he will make a little paper mailbox, have a class party, and exchange dorky cartoon-themed messages and candy with friends. Eeeeeeeeee! What is happening. I loved getting out my valentines as a kid. Writing all the names of my classmates in my best handwriting, carefully adding stickers, taping tiny wrapped chocolates to each one… it was like the coolest most fun thing evuuur. Don’t even get me started on picking them out. Shuffling from one foot to the other trying to decide between the Care Bears, Strawberry Shortcake, and My Little Pony (I think I just dated myself, like really). That was like the hardest decision of my 6-year-old life. My kid and I are definitely cut from the same cloth. He takes forrrrrrehhhvuuurrr (The Sandlot style) to decide what he wants. It has to be just exactly right. He is kind of that way about everything though. We definitely spent over an hour in the toy store this weekend so he could spend a gift card. He walked around and around and around mulling over every single possible combination of Hot Wheels car + Lego +weird Minecraft thing before I finally had to force his hand. I mean… there is really just so long I can spend in a toy store, you know? And maybe I was in a hurry because of the cheesecake bites lurking in my freezer! I love cheesecake! But this is not just cheesecake. It’s cheesecake to the 3rd power. Cheesecake you can eat with your fingers. Cheesecake covered in chocolate and sprinkles. Cheesecake totally worthy of a holiday all about love. I made some really simple smooth and creamy cheesecake bars with a graham cracker crust. I topped them with with a cooked strawberry sauce that is a little tart and a little sweet. 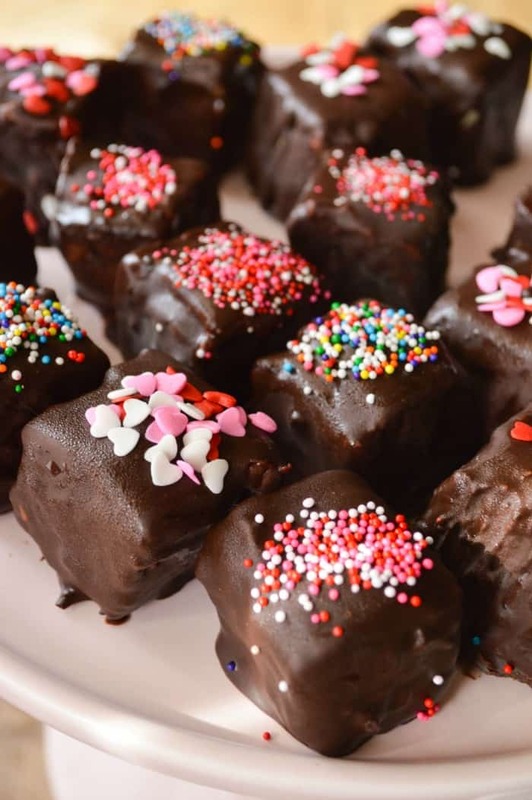 Then I froze them, cut them into bite-sized pieces, and covered them in chocolate. And sprinkles. These little babies are so insanely good!!! Definitely Valentine material. I gave you pretty detailed instructions here, but these are actually really simple. And if you don’t feel like covering things in chocolate, the cheesecake bars are SO DOGGONE GOOD all by themselves. 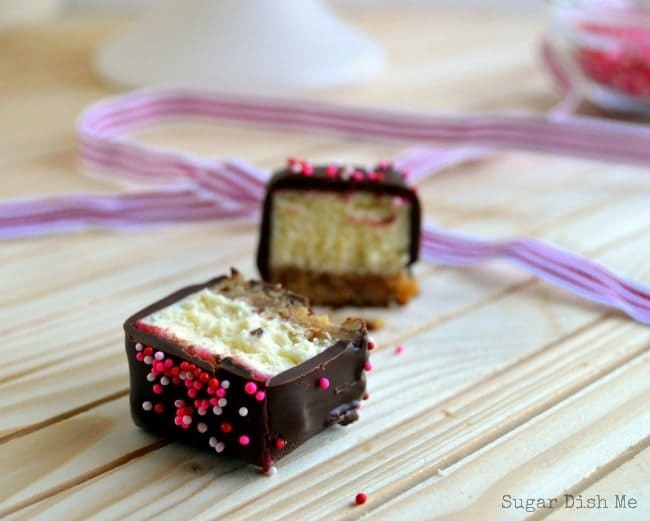 Smooth, creamy cheesecake bars with a graham cracker crust topped with strawberry sauce, frozen and then covered in chocolate and sprinkles. 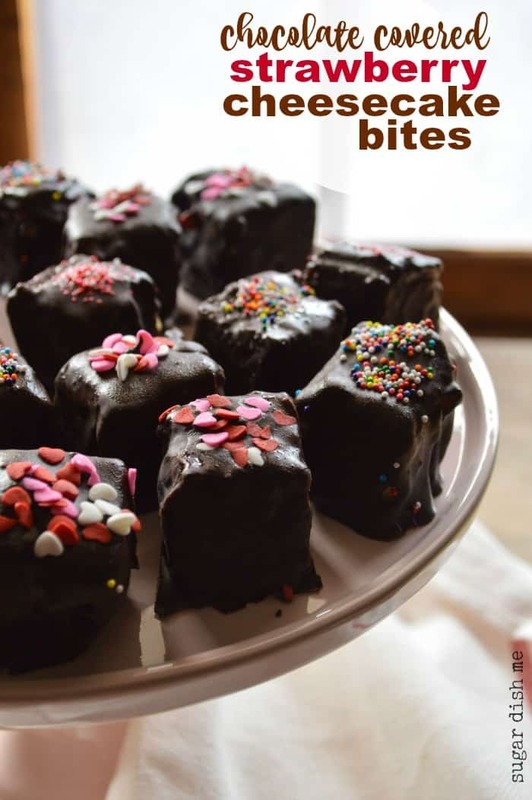 A perfect bite-size little sweet treat!!! Butter a 9 X 9 square pan. Line it with parchment paper and then butter the paper (this will make lifting the chilled bars out and cutting them later muuuuch easier). Pre-heat the oven to 350. In a medium bowl combine the melted butter, chopped pecans, graham cracker crumbs, and brown sugar. Press the mixture into the bottom of the prepared pan. In a large bowl beat the cream cheese and granulated sugar until fluffy and smooth. Add the eggs one at a time, beating well between each addition. Mix in the vanilla and milk and beat for another minute or so until smooth. Pour the batter over the crust and bake for about 15 minutes. Reduce the heat to 275 and bake for another 15 minutes. Turn off the oven (but don't open it!!!!) and let the cheesecake cool and come to room temperature (this will keep the bars from cracking -- they continue to cook a little as the oven temperature falls). While the cheesecake is cooling, place the strawberries, 2 tablespoons of water, and the 1 tablespoon granulated sugar into a small saucepan. Cook over medium heat, stirring occasionally. Use a spatula or spoon to smush the berries so that they break down. Add the additional tablespoons of water if needed to thin the sauce a little as it cooks. You can puree the sauce in a blender if you want. I got my sauce to my desired consistency without the blender just by cooking and stirring. Spread the sauce over the room temperature cheesecake bars and then put them in the freezer.They need to freeze for at least an hour before cutting - 2 hours or overnight is even better. To cut the bars, lift the parchment paper from the pan and place the whole thing on a cutting board. Cut into 1-2" pieces (size will depend on your preference). Place the cut bites back in the freezer. Set up a work area by laying out a couple sheets of parchment or wax paper. 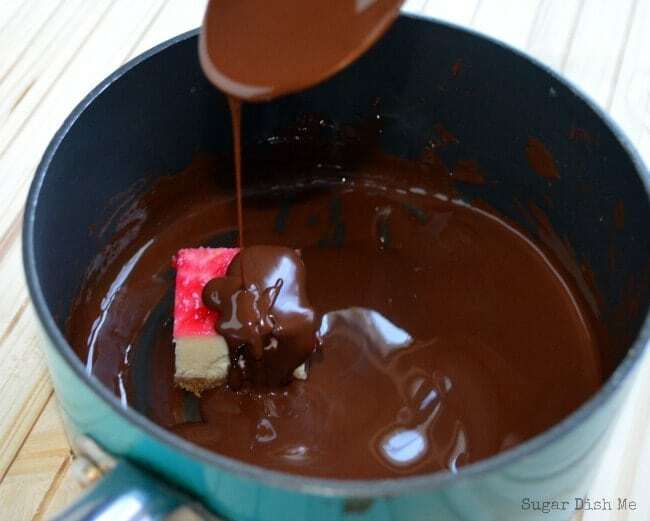 Melt the chocolate and shortening over low heat in a small saucepan stirring frequently. To cover the cheesecake bites, place them in the pan one at a time and spoon the melted chocolate over them (tipping the pan slightly sideways helps make the spooning easier) . Lift them out of the pan with a fork and gently shake off the excess chocolate. Place them on the paper you laid out, add sprinkles and let them set and cool. These are fine stored in the refrigerator but I like mine frozen!! These bars cook pretty quickly for cheesecake (30 minutes of actual baking and another 20 minutes to come to room temperature) but the bars will need to freeze for at least an hour before slicing and covering in chocolate. Make sure you allow yourself the time you need. You may want to make the bars one day, freeze overnight, and then cover in chocolate the next. 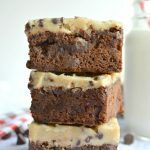 If you want to skip the chocolate part, the cheesecake bars are EXCELLENT as-is! Looking for more sweet treats to gift? I have some ideas! 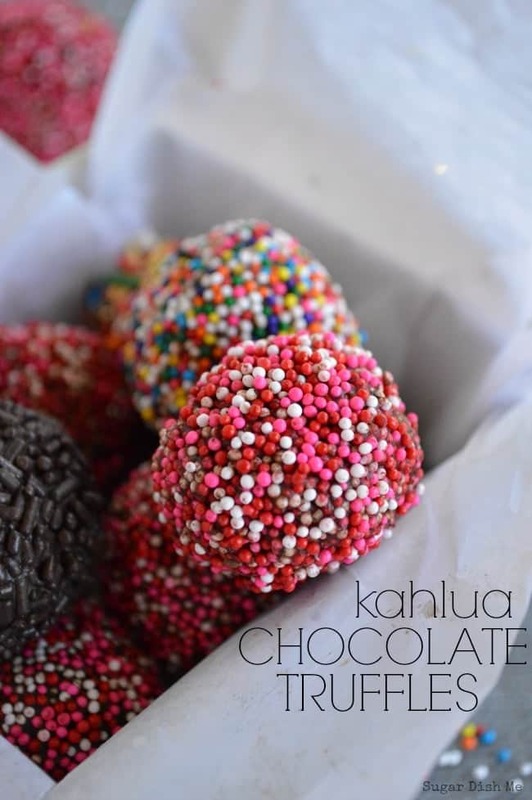 Kahlua Chocolate Truffles are a great was to say how much you care. They are also awesome hostess gifts. What I’m saying is, they will make you lots of friends. 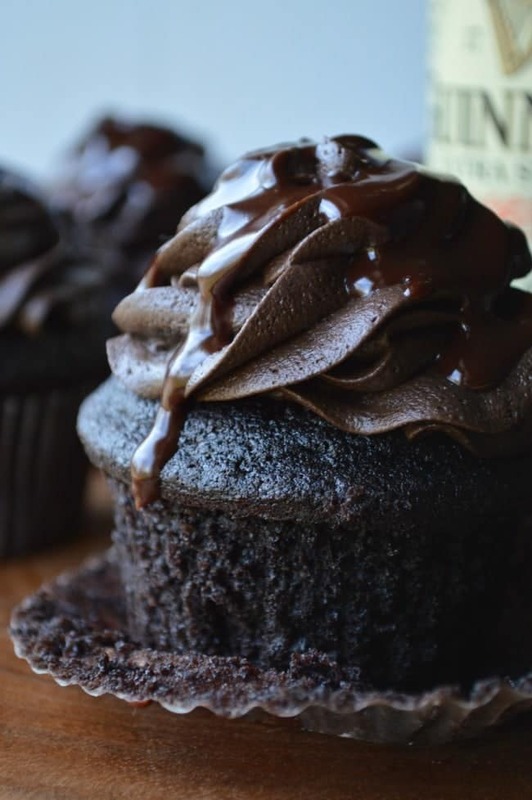 Death by Chocolate Guinness Cupcakes. YUP. They are actually the best chocolate cupcakes on earth. You need ’em. These are so pretty! I can only imagine how good they are. Valentine’s Day was a really big deal when you were all decorating boxes, picking out valentine’s and carefully writing on every one. That was a good time! I hope that Evan has the best Valentine’s Day party ever! Thank you!!! I hope he has to have the best party ever too — we have to make it special! Love these festive little bites!! this is making want to dunk the baby cheesecakes I have cooling in chocolate, so cute! Yes!!! Everything is better dunked in chocolate 🙂 Thanks Sarah! Yes everything IS better when dunked in chocolate! Thanks Jess! I am a firm believer in chocolate. 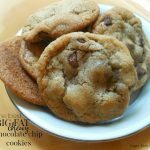 Heather – Oh.My.Goodness…these just look absolutely delicious! I cannot believe Valentine’s Day is almost here as well. January is going by way too quickly. I definitely have to give these bad boys a try! 🙂 Have a great Wednesday! Thank you so much Chelsea! I can’t believe Valentine’s Day is almost here either! Only a couple weeks left to put pink sprinkles on everything. I’m excited! Thanks Mimi! Now, please excuse me while I stalk your blog — I am totally distracted by the words ‘gorgonzola’ and ‘sauce’. Those look so good, perfect for Valentine’s Day!! These look to pretty to eat! Seriously, if they taste half as good as they look, they must be amazing! I’m not even a cheesecake fan and you’ve got me drooling! These would be so cute wrapped up in a box for gifting! That’s a great idea! Thank you Michelle! Oh yum!!! 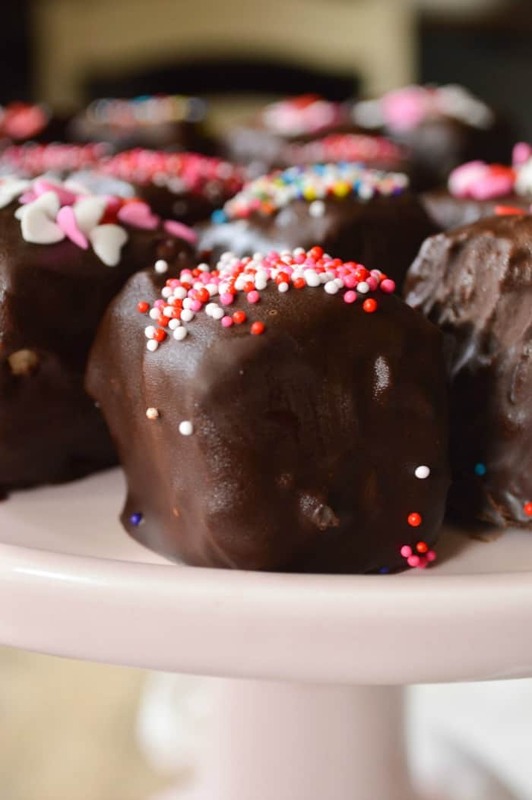 And much easier to make than chesecake pops. Way easier than pop anything!!! Thank you Sarah! I want these so bad!! Cheesecake and chocolate!! LOVE IT! So cute and perfect for VDAY! Okay saw these like blow up on pinterest!! They look and sound delicious! What a fantastic idea and your photos are so pretty Heather! Thank you so much Chelsea! I’ll tell you what blew up though — those cookies of yours I pinned this morning. I love them! I llllooooovvvveeee cheesecake! These are adorable! Thanks Lisa! I also LOVE cheesecake. I’m pretty happy I made it a finger food. Okay, this popped into my wordpress reader and your photos are stunning! Like, jump off the page gorgeous! It’s been awhile since I’ve been here and I’ve been missing what’s going on at Sugar Dish Me. P.S. Loving the new site design, by the way. 🙂 Local designer? Awww thanks so much Allison!!! I really appreciate it! Lauren Gray did my redesign for me. She is not local, but she has a great Etsy store and she is really awesome! I so remember those awesome elementary school make-shift mailboxes for Valentine’s Day. Thanks for taking me back to such great (and at times, awkward) memories haha. 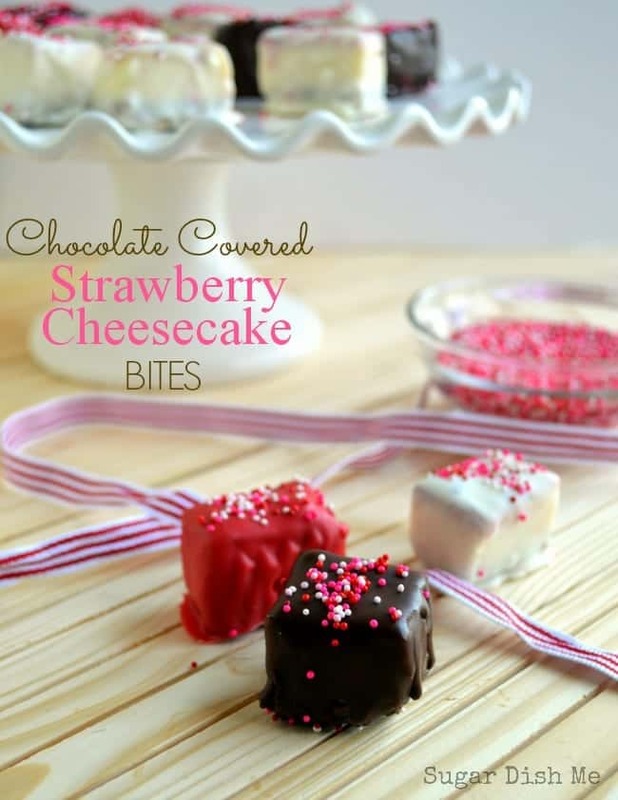 And I’m so loving this idea of cheesecake bites! 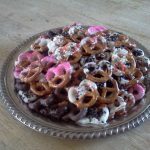 So great for parties! Thank you! I love them. I need to make ’em again!!! 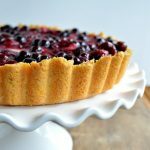 This is such a spectacular recipe and beautiful photo! I made the cheesecake part tonight! It tasted delicious, but next time I will use a few more strawberries. It did not quite cover the top of the cheesecake. Also, the middle was much mushier than the outer edges. Is there something I could do differently? Either way, it was cooked and it tastes really good! Can’t wait to dunk these in chocolate tomorrow! If the middle was too mushy you could cook it at 350 for a few additional minutes before dropping the temperature. I always freeze these before I slice them too — it makes the cuts more precise and the texture more uniform. So glad you like the cheesecake part! The chocolate dipping can take a little practice but after you do a couple it’s crazy easy – let me know how it goes! Im making these for work and one of my co workers is allergic to nuts…any substitution suggestions? Thanks so much! 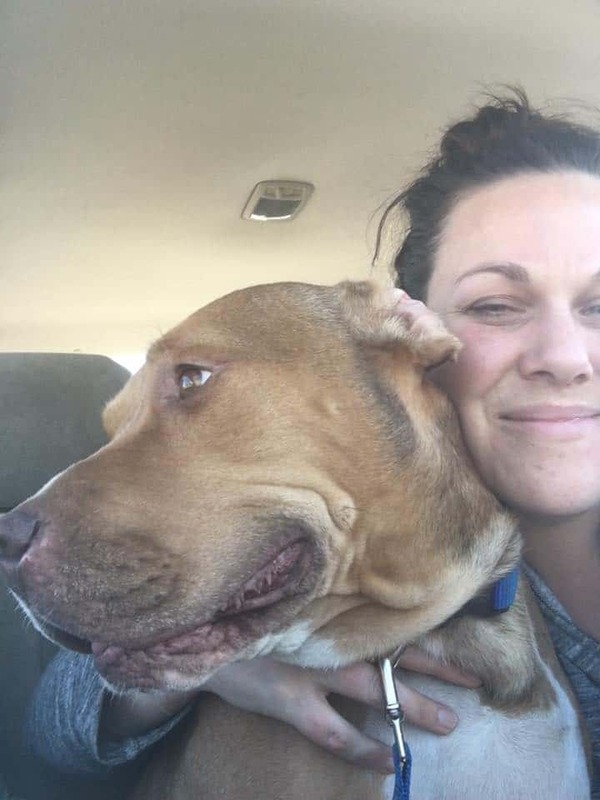 Hi Tasha! I wish you were my co worker!! You’re so nice to make treats! You can just use more graham cracker crumbs in place of the pecans 🙂 Happy baking!